“When Burger King says ‘have it your way,’ they aren’t just talking about food. Hello, I’m Tony Perkins with the Family Research Council in Washington. Is it Burger King or Burger Queen? Customers in San Francisco aren’t so sure after the chain’s new Proud Whopper. Local stores unveiled the rainbow menu to coincide with LGBT week. 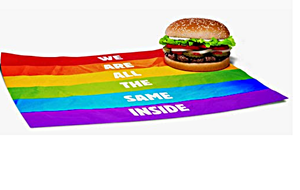 Although nothing’s different about the burger, executives hope the wrapper will make a statement. But even in liberal San Francisco, Time reports, some customers have a beef with the burgers. ‘If that’s what they’re gonna do,’ said one person, ‘they won’t [have] my business anymore.’ That’s the beauty of the free market. If Burger King wants to cater to a fringe group at the expense of other customers, that’s their choice. Just like it’s Cracker Barrel’s decision to support natural marriage and the celebrities who advocate it. The problem is those companies who say they believe in debate and then try to silence it. That’s the biggest whopper of them all.” – KKK-affiliated hate group leader Tony Perkins, speaking on his national radio show. Not to be outdone Tim Wildmon AFA hate group President and the man who signs Bryan Fischer’s paycheck had this to say about BK’s PROUD Whopper. “I am offended by Burger King’s stunt in offering a so-called “Proud Whopper” in San Francisco. What were you thinking? Your celebrated promotion of cross-dressers and homosexuality is an insult to families and I find your celebration of abhorrent behavior as a reason to dine elsewhere. I hope you will learn from this publicity blunder and realize that while most stores did not participate in the corporate-approved program, the damage has been done and affects the image of all Burger King outlets. And by the way Tim and Tony, NOBODY “Dines” at Burger King.